At the Manor House surgery reserved car parking spaces for the disabled are marked near the front door. Wheelchair access to the building is via a ramp near the front entrance. The ramp also allows access to the treatment room from outside in an emergency. Patient services are provided at ground floor level; however, a lift is provided to access the first floor. 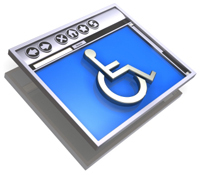 A disabled patients’ W.C. is provided in the waiting area and another is available on the second floor. If access proves difficult to any of our disabled patients we would be happy to consider any suggestions for improvement.